The Odd Couple Review - TV CBS - Are You Screening? Rebooting The Odd Couple is a dangerous game, and adding to the mix of potential kills, Matthew Perry just can’t catch a new sit-com break. Studio 60 should have killed, Mr. Sunshine was rather funny, and though I wasn’t a believer in Go On for a while, it got to me after a few episodes. None of them lasted two dozen episodes, but they didn’t get yanked after, let’s say, four either, so they got some chance to get moving. For whatever reason, where other Friends stars have had certain success (Joey, oddly enough, has one of the best shows on television right now), there’s a certain, “Look Dude, you’re Chandler,” vibe that seems to still be following Perry. More importantly, there’s something very ’70s about The Odd Couple, as a play, an idea, and something we have to work with week after week. In the ’70s, you could milk a gimmick for a long time. There were two other networks, and it was the CBS Thursday Night Movie, or Adam-12. If you wanted to laugh, you had one shot at it. Besides which, it may be a classic now, but it didn’t have amazing ratings. So, with several checks in the negative column, and only the talents of Matthew Perry, and the always awesome Thomas Lennon in the positive column (so far as we know going in), can the show win out? That’s hard to say, mostly because it diverges from the model as much as it sticks to it, and figuring out how the new mix is going to work is rough. The gag itself mostly plays out on the Felix side of things, with O.C.D. neatness mixing with odd ideas about the etiquette of hosting poker night. Oscar is messy, in a kind of technical sense, and you only see it for the first couple of minutes of the pilot, until Felix gets a chance to clean. After that, it’s really more that he leans toward being selfish, has a severely “guy” mentality when it comes to wanting to hook up with women, and doesn’t press his shirts. He’s a slob largely by virtue of the fact that we’ll reference his slovenly nature, and being far to one side of Felix on the neat-meter isn’t hard to do. Worse, the original show kept itself going by virtue of the fact that Oscar, who remained a full-blown slob, kept digging at Felix, and Felix could try the patience of a saint. Though obviously not just a re-write of the opening episode, the show legitimately cornered two opposites, to look at the clash of character. Here, Perry, at least out of the gates, seems to be more like “your average, middle-aged bachelor,” but turn up the lazy a couple of notches. Felix gets on Oscar’s nerves, but in a “modern,” dare I say, almost Chandler-esque sense. Thus, when push really comes to shove, Oscar, more or less, just says, “Ohhh… my… God! Could you BE any neater?” Meanwhile, the episode ends with Felix admitting that he better learn to loosen up. It turns out that it’s actually a pretty funny show, and the stars both have enough charisma to carry anything for a couple seasons without any backing. The supporting cast is solid, though it’s unclear how regularly we’ll see the whole group. Wendell Pierce doesn’t get much more than an introduction, but looks to be a regular feature as Oscar’s agent. He’s already good, and it’s good to see him back after The Michael J. Fox Show. Community‘s Yvette Nicole Brown will be a major plus for the show, though we haven’t seen much so far. It’s fairly fun, and funny, but there’s some meat that the show needs to establish over the next few episodes, if it wants people to come back. As it stands, funny or not, it can’t quite live up to the title sequence of the original, and can’t even match the legendary gravitas of the narration. This Oscar isn’t going to throw his cigar on the street (because someone would write a letter), and something about the pointedly-serious baritone of, “Can two divorced men share an apartment… without driving each other crazy?” just isn’t talking about these guys. It’s potentially a 3 or a 10, and if it wants to hit hard, it has to get a bit bolder. 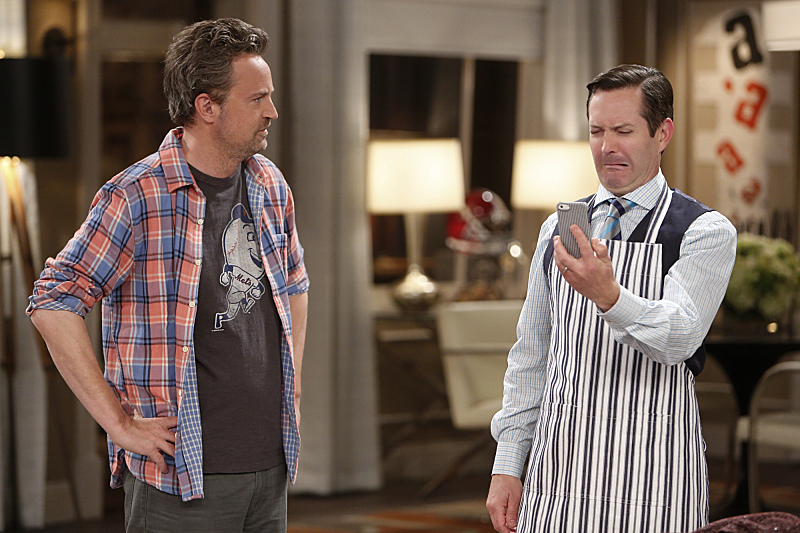 THE ODD COUPLE stars Matthew Perry as endearing slob Oscar Madison and Thomas Lennon as uptight neat freak Felix Unger, two former college buddies who become unlikely roommates after the demise of their marriages. It’s not long after Oscar lets Felix move in that Oscar fears he’s made a monumental mistake. Oscar’s jack-of-all-trades assistant, Dani, and his long-time agent, Teddy, have their hands full trying to keep Oscar’s career as a sports radio host on track as he deals with his new living situation. Fortunately, their quirky next door neighbor Emily helps Felix adapt to his new life as a bachelor and rein in his copious eccentricities. Despite how exasperated Oscar and Felix make each other, in the end, these mismatched friends agree they can help each other move on from their divorces and somehow make this crazy living arrangement work.